Editors Note: About a year ago I received an email asking me if I would consider being the judge of an essay contest for some young girls. While I strongly want to encourage young girls to write and feel it is essential that they have a creative outlet, at the time of the request I was extremely busy having just launched this site. I continued the email correspondence with the editor and was impressed with her professionalism, attitude, approach and flexibility. At some point in the conversation, I discovered that this editor I was dealing with was none other than a twelve year old girl! (Needless to say, I agreed to judge the contest!) I asked Leah to share her story here. I think it is an important reminder to all of us that the power of a woman starts with the power of a girl! "Wouldn't it be cool to publish a magazine for Jewish girls?" The lunchroom bustled as the girls in my sixth grade class found our seats. Typically we looked through the contents of our lunches and traded snacks. My friends chatted about the usual: homework problems, a friend's upcoming Bat-Mitzvah, the book report that was due... Then, I had a brainstorm, "Wouldn't it be cool to publish a magazine for Jewish girls?" My friend was used to my constant flow of ambitious but usually impractical ideas, so she simply responded, "Yeah, but we could never do it." And that was it. The conversation moved on to the upcoming field trip and the idea was pushed to the back of my mind. At least for some time. Starting my own magazine wasn't some brilliant idea that had just dawned on me, but probably the first time I had voiced it. I was always an avid magazine reader, and could spend hours curled up with back issue of magazines like "American Girl". Still, there were many articles I couldn't relate to as a Jewish girl, and I was frustrated by the limited amount of good magazines for girls my age. I had always wanted a magazine for Jewish girls— one that would provide fun reading and connect Jewish girls with Jewish values on every page. Fast-forward about a year after that lunch room conversation. Experimenting with new photo editing software on my computer, I discovered I could make magazine covers. So I tried out a few, remembering my idea. I used the name "yaldah", the Hebrew word for girl. And I started thinking... why not? What's stopping me from making this magazine? Hey, I even have the cover already! Besides for the publishing, there was also the business angle. I had to go cross-eyed reading the fine print on the application form for a tax ID number, open a bank account, learn to use accounting software, and set up a website and online shopping cart so I could take credit card orders. I learned how to write press releases, fundraising letters, and articles. I spent hours researching printers and getting quotes. After a few phone calls, I learned that it worked best if I didn't say my age. One printer looked like a good possibility and sent a representative to my house to discuss printing options. When my mother answered the door he said, "Nice to meet you, Leah." He was in for a surprise when I said I was the Leah he had spoken with on the phone! When I brought the first issue to school, everyone was excited and surprised. I had discussed the magazine with friends before, and even passed around pages to proofread during class, but I don't think anyone really thought it would become a reality. Although my parents were very supportive, I think at first they also thought it was another one of my crazy new ideas. Once I had a real magazine to show people, they began to take me seriously. As word spread, orders poured in and the first issue sold out. I was kind of surprised that people would send checks off to a twelve year old girl, trusting that they'd get a year of magazines. Now we have over 750 subscribers. While I was in school, homework and being an editor was a constant juggling act. I tried to do most of my homework in school, leaving my evenings free to work on the magazine. Usually I was able to keep things balanced well; to maintain my grades and stay on top of the magazine work. Once, I remember, I had to approach my English teacher trying to explain that I couldn't finish the essay because I had been up all night sending the next issue to the printer. Even though the teacher appreciated the challenge of being an editor, she felt it wouldn't be fair to the other students to excuse me. The irony of course is that I learned more about English from editing that issue than writing the essay! Now I am homeschooled, so although I still have to work to maintain a balance between school and my magazine, I have a more flexible schedule. I can learn more quickly, and get high school credit for some YALDAH work. After a hard day of work, it's the letters and e-mails I receive from girls that truly remind me that all the effort is worth it and that the magazine is accomplishing its goals. One goal that it has accomplished is connecting Jewish girls and making them feel part of a greater whole. Having lived in a community where it was easy to feel that I was the only Jewish girl, it was important to me that other teenagers felt they had a place where they could connect to other Jewish girls. It turns out that not only a magazine came out of this dream, but a community as well. We even had a Jewish Girls Retreat and had girls from all over come together. We sang and shared and it was really inspiring. There is such unity and respect between girls. Another one of my goals was to give girls an outlet for creative expression. It's encouraging to see all the talents that young Jewish girls have, and to see them being put to use. Very often, if it isn't a school assignment, girls don't have many options for sharing their work. I wanted to make sure that they did. I hope to inspire other girls to pursue their dreams, whether it's starting a newspaper, directing a play, organizing a fundraiser, or founding a business. As eight year old Shayna wrote to me, "I really admire you, Leah. You inspired me to think I can do it! Now I know I can make a difference in people's lives." That really sums up what I hope to achieve: for every Jewish girl to take initiative, and become a leader. Start something new, reach out a helping hand. There is tremendous power in young girls, and together, we can change the world. I hope my magazine shows girls that they don't have to wait until they grow up to accomplish something. No matter how old they are, using their talents and determination, they can make their dreams come true. Children have the blessing of innocence. I had a dream that I believed in, and that was it; I knew it had to happen. Many adults may have analyzed all the details, the budget, if there's a market, who the staff will be. They might have tried to anticipate any problems that could come up and find solutions. I knew it would be hard work, but I didn't anticipate many of the challenges I would face. I just knew that I had a mission, and that was it, I would succeed. So parents, never underestimate the power of a determined child. 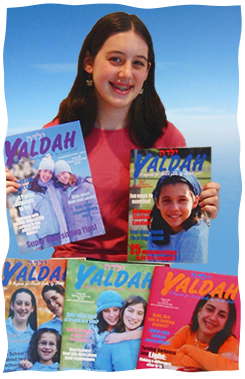 Leah Larson, age 18, of Sharon, MA, is the founder of YALDAH Media, Inc., and publisher of YALDAH Magazine, a magazine 'for Jewish girls, by Jewish girls' which she started at age twelve. YALDAH's newest branch, YM Books, released its first book, The Yaldah Year,which Leah co-authored, in October 2009. CREATIVE & PASSIONATE JEWISH EMPOWERMENT Hello Leah: First of all - I love your name! You and Your Article is a Breath of Fresh Air and Inspirational to all Young Jewish Ladies! You are providing inspiration and Empowerment for Young Jewish Ladies Demonstrating Such Passion and Belief in Their Own Jewish Individuality - You are a True and Born Leader! I am a Jewish Certified Astrologer for almost thirty years and have a passion and devotion for Ladies and Women - Women Move the Universe! One of my passion is to work with young ladies on an educational and universal plain and as Jewish Women always remembering Our Roots in Our Jewish Faith and Heritage. My inner soul and core and light of my life are my grandchildren and great-grandchildren, who will read and enjoy your magazine. Hey Leah! I saw your video and you are one incredible young woman. I also voted for your Someday Stories as I truly thought that you were the best candidate.